Craft breweries continue to open at breakneck speed across this great land of ours. Godspeed to all of them. One of the newest is King Canary Brewing Co., which caught our collective attention because of its location. 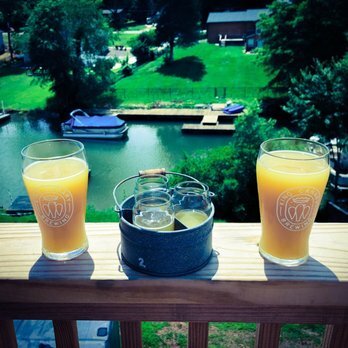 This “family-friendly brewery” is situated near beautiful Lake Norman in Mooresville, N.C., right on an inlet (dig this photo). King Canary celebrated its grand opening in mid-May (we’re just getting the press release now) and are today in full swing as a taproom offering classic and unique beers. Founders Matt and Andrea Gravina welcomed their first guests after conceptualizing, planning and renovating the brewery. The Gravinas’ left the corporate world and moved to North Carolina two years ago from Florida, with their two children, to establish the brewery. Matt Gravina, a former CPA, and forensic accountant spent the last five years home brewing before attending Chicago’s Siebel Institute for his brewing education and now heads brewing operations for King Canary Brewing. Andrea Gravina, who spent the past decade working in marketing and merchandising for Ralph Lauren, is responsible for design, marketing strategy and community outreach. The recently renovated 4,500-square-foot multi-story brewery features bars on two floors with a combination of traditional bar seating and a variety of nooks with couch groupings and repurposed church pews. Expansive windows and outdoor seating areas allow guests to access the lakefront views. The King Canary branding pays homage to the brewery’s spirit animal symbolizing a new beginning. Design elements throughout the brewery reflect unique familial connections through a “Feathers of our Flock” family crest while unicorn and turtle icons on glassware pay tribute to the couple’s son and daughter. Currently, the brewery/taproom is open Sundays noon-8 p.m., Tuesday-Thursday from 4-10 p.m., Friday from 4-11 p.m. and Saturday from noon-11 p.m. Families are encouraged to attend and the outdoor areas are dog-friendly. For details on live music, featured food trucks, and events visit the King Canary Brewing Co. Facebook page.